Dennis Riggs, Emergency Manager for the City of Sutherlin, will be at Timber Valley on Friday, Sept. 21, 3 p.m. in the Clubhouse. He will update us on what the city is doing to prepare for disasters and how best we at Timber Valley can coordinate with the community. Come with questions. 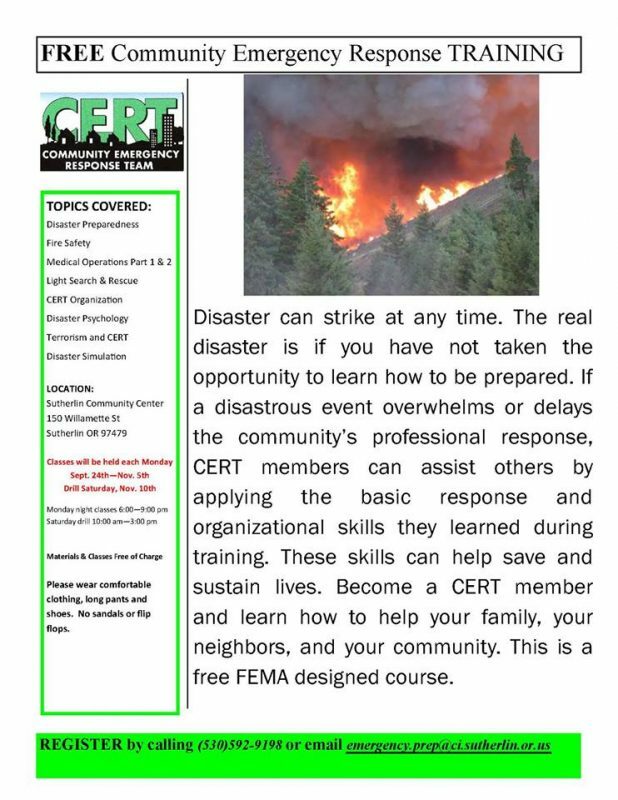 In addition Dennis will speak about the free Community Emergency Response Team training that begins on Monday, Sept. 24, at 6 p.m. in the Sutherlin Community Center. This entry was posted in Events, Life at Timber Valley, News, Volunteer Opportunities and tagged Emergency Preparedness. Bookmark the permalink.